Successful in the 2016 renewal and second last year, the 10-year-old son of Sir Harry Lewis, who runs in the colours of J P McManus, took the lead approaching the final flight and responded willingly to Geraghty’s urgings in the closing stages to score by two and a half-lengths from Clyne (Evan Williams/Adam Wedge and the gallant The Mighty Don (Nick Gifford/Leighton Aspel), who was a further two lengths behind in third. Unowhatimeanharry, registering his seventh Graded victory including three G1s, also became the first horse since Big Buck’s (2009-2012) to win multiple renewals of the three-mile contest. 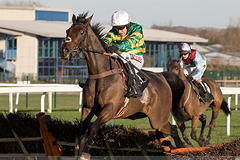 Fry’s charge earned a quote of 25/1 with Ladbrokes for the Stayers’ Hurdle at the Cheltenham Festival in March. Winning trainer Fry admitted watching the finish of the race was “slightly strange” as he also saddled Momella (Noel Fehily), who fell at the second last, bringing down Sam Spinner (Jedd O’Keeffe/Joe Colliver). Wholestone (Nigel Twiston-Davies/Daryl Jacob) came home last of the five finishers. Fry said: “Unowhatimeanharry did it well. It was a slightly strange finish to watch as I was trying to keep an eye on Noel and Momella to check they were OK, as well as watching the actual finish. Thankfully, Noel and Momella are fine. “Unowhatimeanharry has just been an incredible horse for us. He hasn’t won for over a year and it looked last year as if things were on the wane. “He went back to Martinstown (the owner’s stud) over the summer. He had a good break and they looked after him brilliantly. We did a few little things with him too, including tweaking his wind and we have been really happy with him this autumn. “He ran well at Aintree earlier on his seasonal debut as he probably doesn’t have the speed for two miles and four furlongs nowadays, but we took plenty of encouragement from that. “We put the cheekpieces on today to encourage him to travel better through his races and we knew today that he was an older boy who has been there and done it, so we were hopeful. “He didn’t have a penalty for the first time today in this event and we are delighted to get him back in the winners enclosure. “Unowhatimeanharry has done us so proud and I am just delighted he has won again. The cheekpieces and the slower ground have definitely helped him today. “Watching the replay, I thought it wasn’t likely we were going to win, but Barry said that he jumped his way into contention – he is a brilliant horse. “We will enjoy today, before making any other plans. We are just enjoying the fact that he has given us another big day. “Unowhatimeanharry has been an extraordinary horse for us. When he joined us three years ago, he was a 123 rated maiden and he is now a 12-time winner, a three-time G1 winner and this is the second time he has won this race. You cannot script it, this is just extraordinary. “I am not suggesting he is as good as he was. That is why it is great to have him back winning, especially after the way he ended last season. We will enjoy this moment because he has been a fantastic horse for us. “Some of my horses went off the boil last season. It was not our best season and things did not happen but, touch wood, we have made a few changes at home and they seem to be clicking into gear nicely. It is credit to all the team at home and their hard work. Hopefully, we can keep the ball rolling now. The Grade Two Ladbrokes Long Distance Hurdle usually goes the way of the top staying hurdler in training. The 2017 renewal featured a clash between the previous two winners, Unowhatimeanharry and Thistlecrack, but there was a shock result when 40/1 chance Beer Goggles made all under champion jump jockey Richard Johnson for trainer Richard Woollacott. Unowhatimeanharry finished second, while Thistlecrack came home fifth. Unowhatimeanharry won impressively in 2016 and went on to capture two G1 races during the season for owner J P McManus, trainer Harry Fry and jockey Barry Geraghty. Thistlecrack was untouchable during the 2015/16 campaign. A six-length victory at Newbury on his comeback was followed by a string of facile displays, culminating with totally dominant victories in the G1 Stayers’ Hurdle at Cheltenham and G1 Liverpool Hurdle at Aintree. Record-breaking stayer Big Buck’s (2009-2012) reeled off four successive victories at Newbury during a four-year winning streak that spanned 18 races, including an unprecedented four G1 Stayers’ Hurdles. Inglis Drever also made the race his own between 2005 and 2007. He captured his first G1 Stayers’ Hurdle in 2005 and recovered from a career-threatening injury to regain the crown in 2007 and 2008. French raider Baracouda (2003 & 2004) was a regular on these shores for Francois Doumen. He won 14 of his 19 starts in Britain, notably a record four G1 Long Walk Hurdles and two G1 Stayers’ Hurdles.